The Olive Ridley sea turtle’s name derives from the olive-green, hear-shaped carapace of the adult. Considered the least threatened of the sea turtles. They are also known as the Pacific Ridley sea turtle. The habitat of the Olive Ridley range is widespread through the tropical water of the northern Indian Ocean. They are also found in the Atlantic Ocean and the eastern edge of the Pacific Ocean. The adult Olive Ridley carapace can reach 22 to 30 inches long. 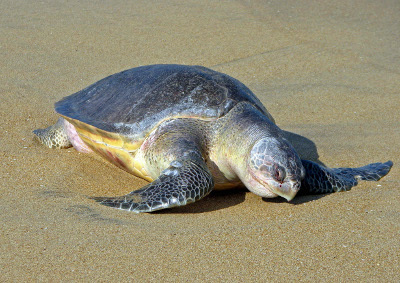 The Olive Ridley is considered one of the smaller sea turtles. The olive Ridley adult sea turtle can weigh 78 to 100 pounds. Their diet consist of algae, lobster, crabs, tunicates, mollusks, shrimp and fish. They are threaten by incidental captures in fishing gear and by the collection of turtle eggs.